I may not be able to continue posting every day. My laptop is doing bizarre and uncomfortable things. Anyway, here’s part of what I did today. 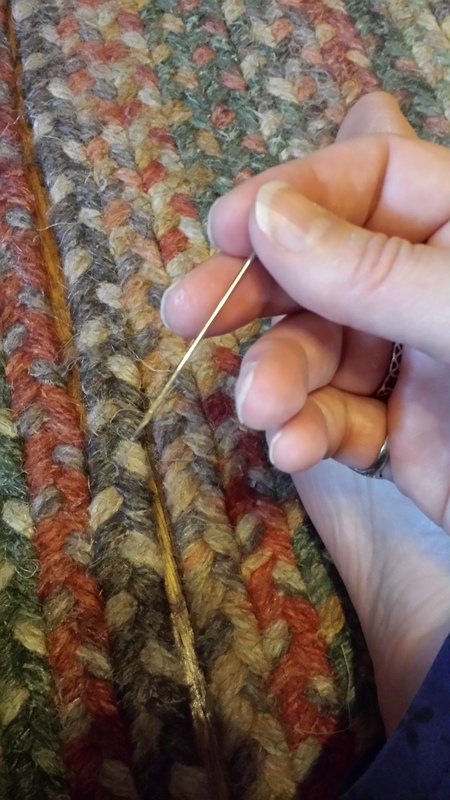 Repairing a huge braided wool rug that we bought for only ten bucks at a church rummage sale a few years ago. The only catch was it was coming apart at the seams. At the time I thought I’d repair it after I recovered from my hand surgery. Better late than never. It was one of the best deals I ever found. It was absolutely clean so I suspect that it started coming apart after they cleaned it and whoever it was decided to sell it cheap rather than repair it. I did a little research and this rug would retail around $900 on the low end.